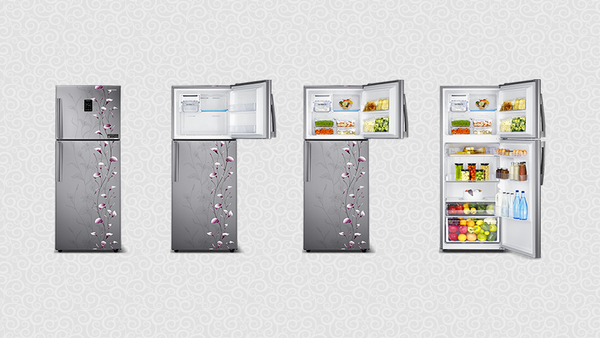 Home > Buzzwords > The Best Samsung Fridge Glossary Ever! 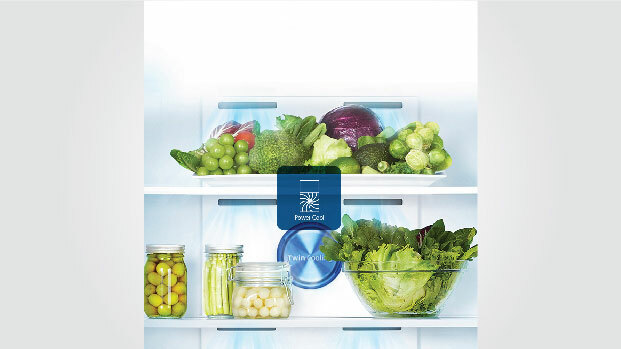 The Best Samsung Fridge Glossary Ever! 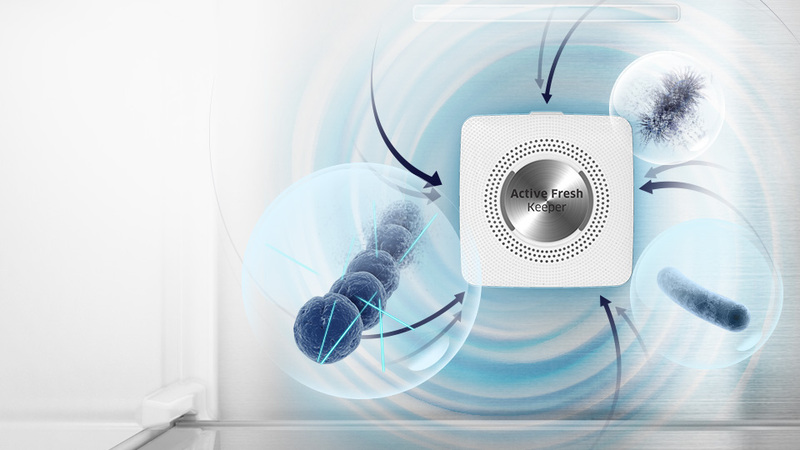 Active Fresh Keeper keeps the fridge clean and hygienic. Air is passed through an Activated Carbon filter, so it is constantly deodorised, while an anti-bacterial mesh eliminates bacteria. What this means for you: Air passes through a filter made of activated carbon and freshens before passing through an anti-bacterial mesh to kill bacteria. It is then recirculated in the fridge but without any bacteria or odours. What this means for you: Every shelf and every corner of the fridge gets uniform cooling from multiple outlets at every level to keep freshness at a maximum level. What this means for you: Additional space for holding items like onions, potatoes and garlic that do not need refrigeration, but can be a hassle to store elsewhere. It is in the form of a drawer above the base of the fridge so it slides in and out. The Big Guard is deeper than shelves found in conventional refrigerators. 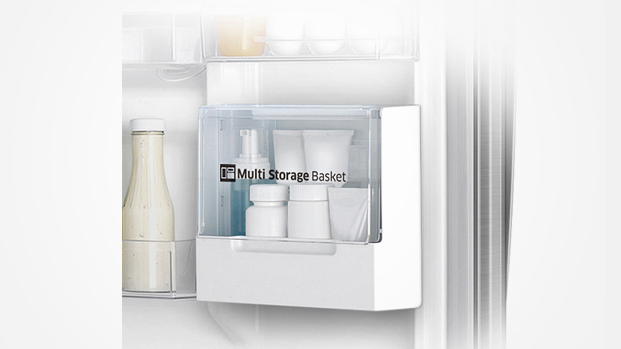 So you can store big containers of milk and juice in the door, along with two rows of beverage cans and bottles. The Big Guard is also great for chilling tall drinks bottles. What this means for you: A bigger storage space for beverage cans and tall bottles. 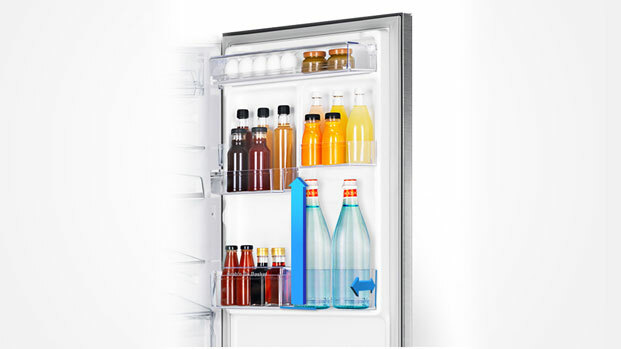 Unlike in other fridges where you have to keep them horizontally on shelves, the Samsung door bins have enough space to hold tall bottles vertically. 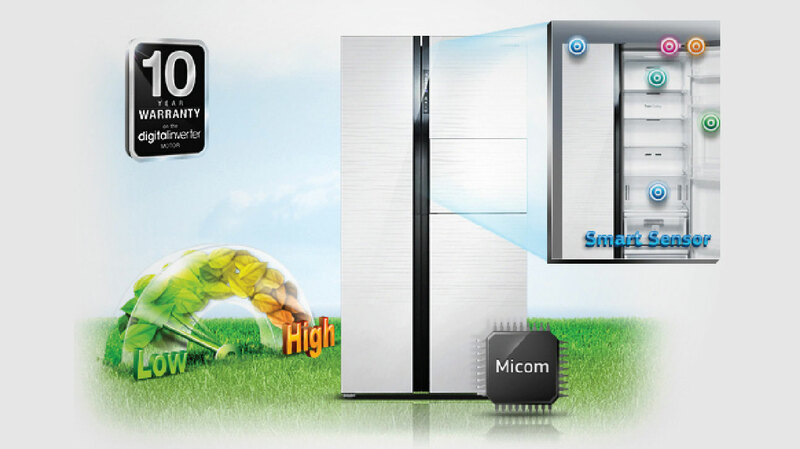 The Smart Convertible 5-in-1 Refrigerator allows the freezer to convert into a fridge with five different mode options. Apart from Normal Mode this comes with Extra Fridge Mode which is perfect when there is a need for additional fridge space. So now if you bring home more bags home just convert your freezer into a fridge with ‘Extra Fridge Mode’. 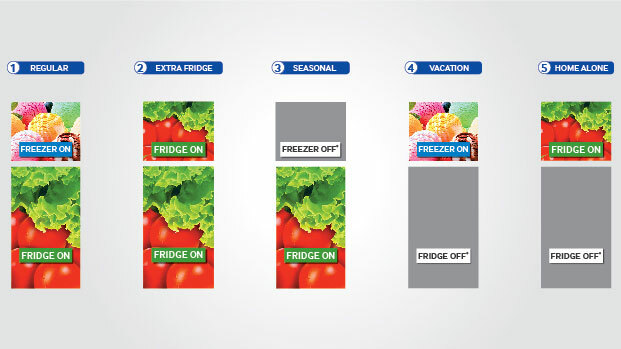 If you are going out on vacation & need to store some food in the freezer, simply switch on ‘Vacation Mode’ and keep only the freezer on & turn off the fridge section. With a change of season just switch to ‘Seasonal Mode’ keep only the fridge on & switch off the freezer. When alone at home and don’t have a lot to store just switch to ‘Home Alone Mode’ that switches off the fridge and converts freezer section into a fridge. And not only the 5 conversion modes are the perfect solution to different storage needs but every mode also saves energy giving more savings. 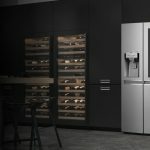 What this means for you: The fridge is a very flexible appliance now with the convertible mode, where you can change how the fridge or freezer functions depending upon the above situations, and maximise storage space and cooling needs. 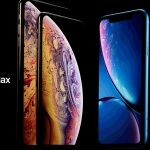 There are five different modes to choose from, each equally useful, and this feature can make food storage really convenient and requirement-based. The Coolwave feature comes to the rescue during power outages. 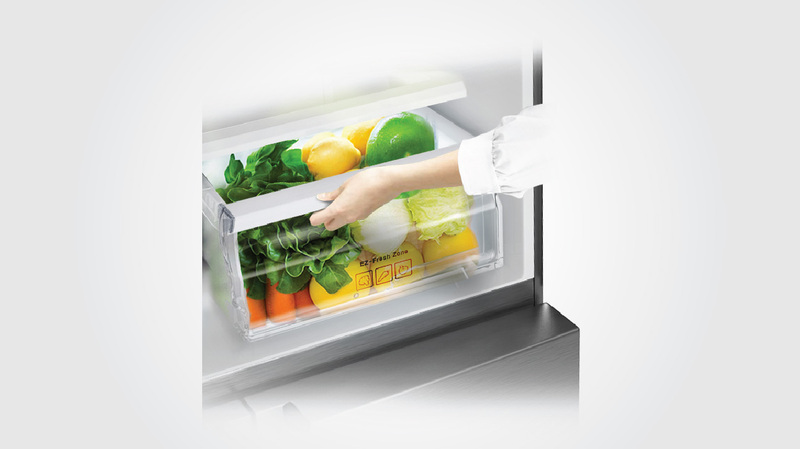 It keeps food chilled and frozen for 9 hours by maintaining an internal temperature below 0°C. Its ridged design also provides safe storage for bottles. What this means for you: Like a chill pad in other fridges, the Coolwave in a Samsung fridge helps maintain cold air at 0°C for up to 9 hours in the event of a power cut. The compartment has a grooved interior so you can actually utilise this space and keep bottles horizontally. What this means for you: Keep your dairy items separate from other foods in a transparent and covered box to prevent mixing of odours and to ensure you can see them and consume them within the recommended date. What this means for you: There is often a lot of space inside a fridge that goes waste because you cannot put a shelf there. Samsung makes intelligent use of some of this space with a detachable deli bin that you can use to store not just deli foods, but any small items. 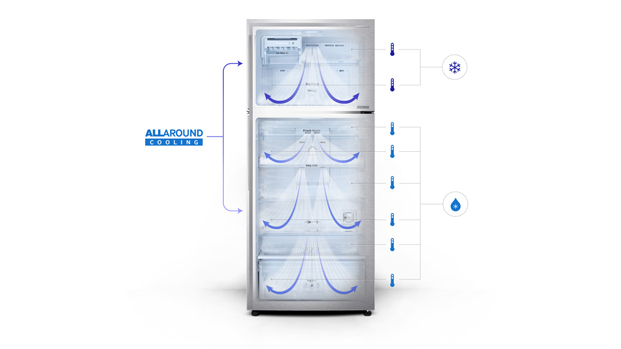 What this means for you: Unlike regular compressor, the digital inverter compressor in a Samsung fridge comes into action according to cooling demands in the fridge in 7 different speeds. This means lower energy consumption, less noise as it works and longer durability of the compressor. Dual Fan Technology allows independent temperature control of the freezer and fridge (convertible Samsung models) with two separate fans. So, you can convert the freezer into a fridge and back into a freezer with ease. Now, get optimum cooling and quick, effective circulation of cool air too. 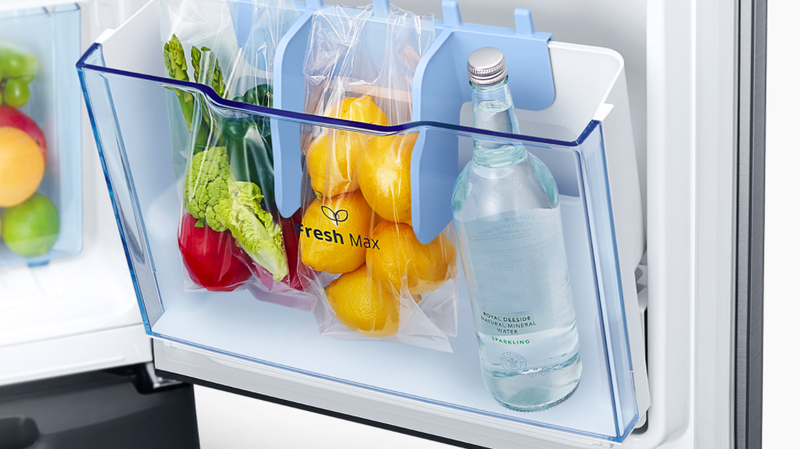 What this means for you: Additional flexibilty because you can easily convert your freezer into a fridge and back. Independent temperature control ensures this is done seamlessly. 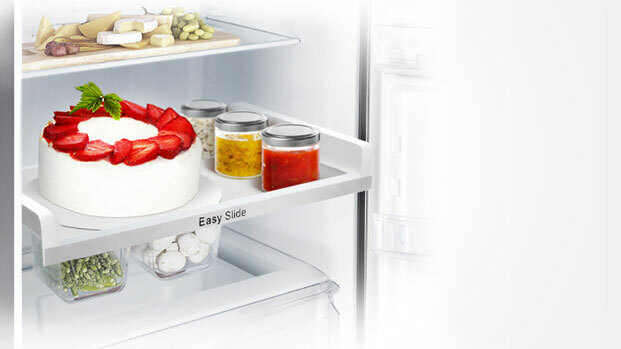 What this means for you: You can customise the space inside the fridge by sliding out, removing, or folding up the shelf, and it can also be put in grooves above or below for additional flexible spacing. In addition, you don’t need to make an effort to reach the back of the shelf. You can easily slide it out and see what’s on the back. 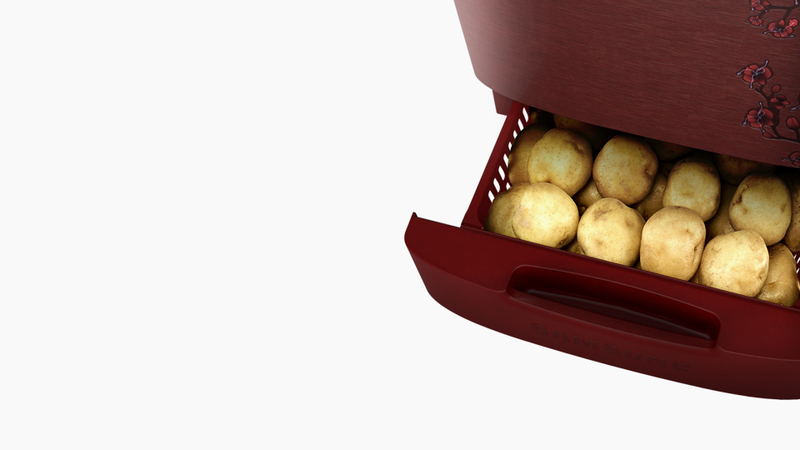 A multi-utility door bin, FreshMax, provides extra space for fruits and vegetables. There’s a special divider to attach plastic bags and separate bottles, it tilts to easily put in and get food and has a deodorizer. What this means for you: You can keep fruits and vegetables in separate plastic bags in the Freshmax bin in the original plastic baggies they came in to prevent odours from mixing. You can also keep bottles here. The bin opens at angle for easy access and auto-closes. 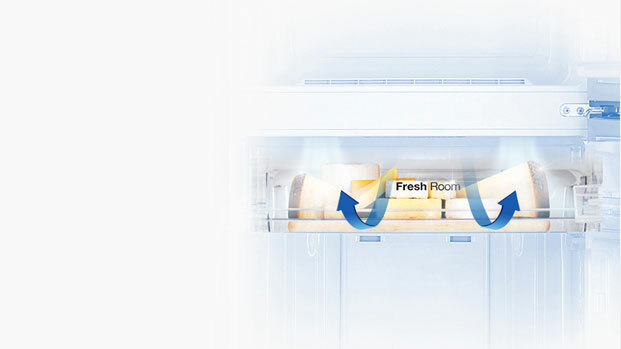 What this means for you: Like the Dairy compartment, the Fresh Room is a covered box that keeps your fresh salad greens and dairy separate from other fresh foods and prevents the mixing of odours. Even if the fridge door is opened, the temperature in the Fresh Room does not change. 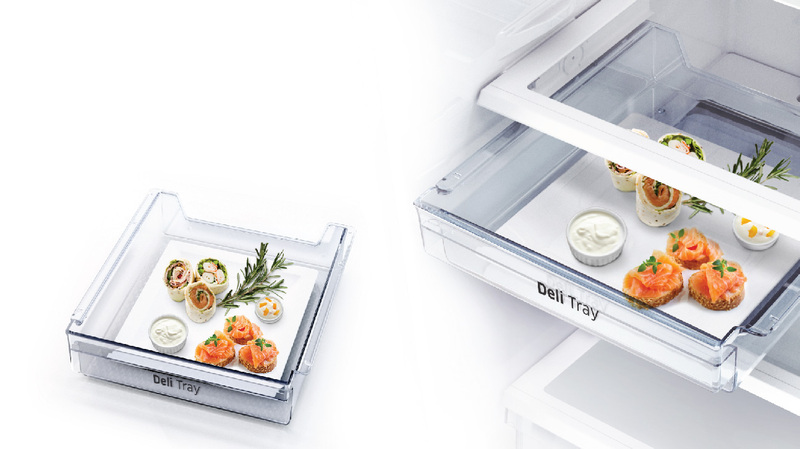 Whether you’re using the crisper to stores fruits, vegetables or cheeses, you’ll appreciate its counter-height placement, which gives you convenient access to favourite foods. Easily pull an apple out for your child, deli meats to make a sandwich, or a head of lettuce for a healthy salad, without having to bend over and put a strain on your back. 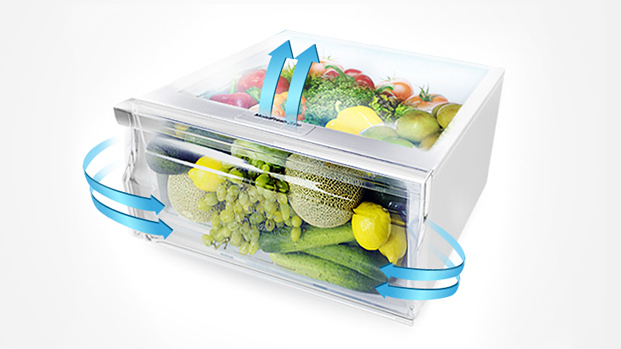 What this means for you: While it is called a Fruit Crisper, this compartment can actually store vegetables, cheeses and even meats. It is placed at a very convenient height so you don’t have to bend or crouch to get access to it. What this means for you: The Moist Fresh Zone is best for fruits and vegetables because it maintains moisture at an optimal level irrespective of the level of humidity outside this tightly sealed box. The Multi Storage Basket is the ideal place to organise and store various items – from favourite condiments and sauces to cosmetics and medicine that need to be kept cool. This separate compartment helps keep you organised, and can be detached and easily moved as desired. What this means for you: You get an additional bin to keep small items ranging from chocolates and condiments to cosmetics and medicine. It is also detachable and removable for convenience. 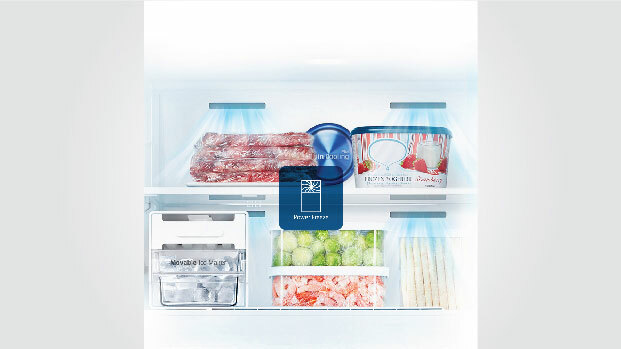 What this means for you: Because there are as many as nine sensors spread across the fridge, the Digital Inverter Compressor (see below) is able to take better stock of the cooling demands in the fridge. It then resets the compressor to work according to the cooling needs, meaning there are significant savings in energy costs for you. Quickly chill food for optimal freshness after a trip to the market with the Power Cool feature on a Samsung refrigerator. 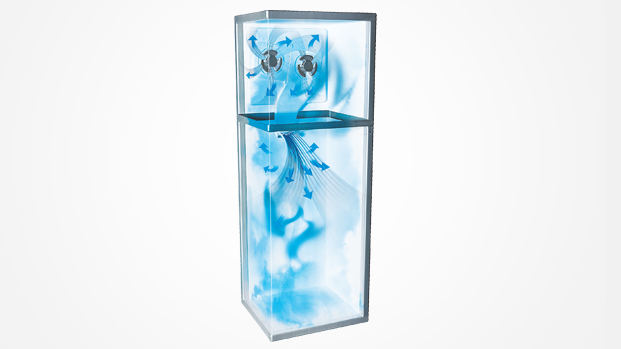 At the touch of a button, cold air is blown into the refrigerator to temporarily reduce the inside temperature to 1 °C. With its almost instant chill, food will stay fresh longer while beverages will be quickly cooled for drinking. What this means for you: When you food fresh items in the fridge, they usually take a while to get chilled, and this can cause a rise in the internal temperature of the fridge as well. But with Power Cool, you have to press a button and the internal temperature is brought down to 1°C so ensure fast cooling of the items you just put in and maintaining the coolness of the remaining compartments. With the Power Freeze feature on this Samsung refrigerator, you will have ice cubes anytime with just the push of a button. So it’s a convenient way to reduce the waiting time when you need real quick ice. What this means for you: The next time you need ice very fast, the Power Freeze feature can be turned on to hasten the process of making ice so waiting time is minimised. What this means for you: When you keep a new item in the fridge, it is warmer than other existing items. Or open the door, the internal temperature can rise. 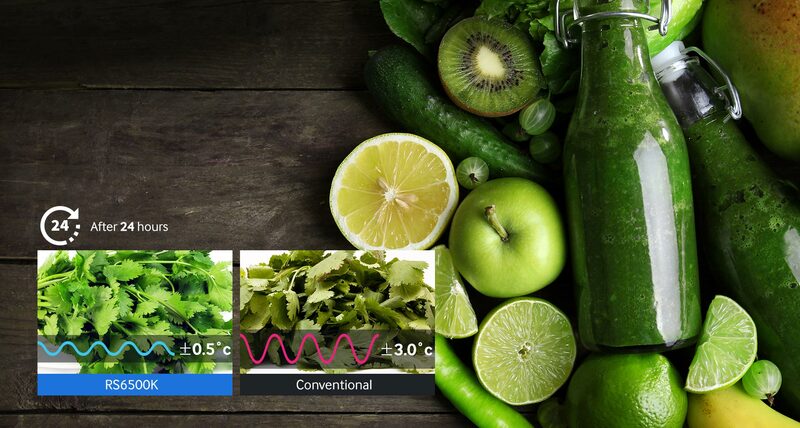 This technology uses sensors to judge this change in temperature and controls the compressor to keep the fluctuation within ±0.5°C to keep all items fresh for longer. 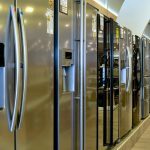 What this means for you: Your fridge can continue to run on back up power if you connect it to your home inverter so there is absolutely no chance of spoilage because of a disrupted power supply. 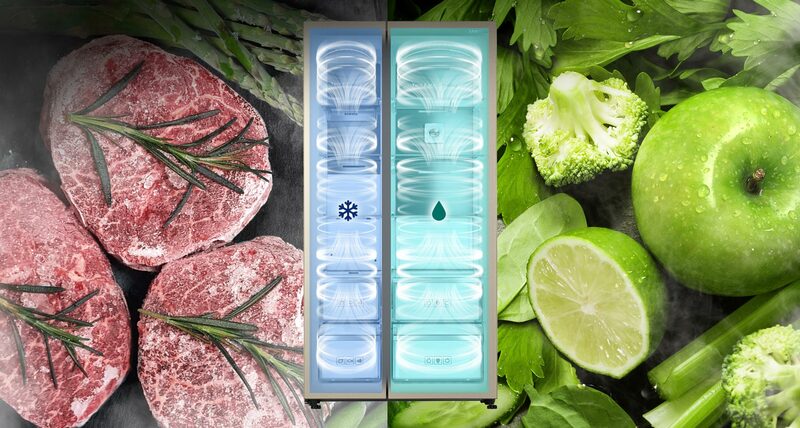 Twin Cooling Plus™ cools the fridge and freezer compartments separately. Independent evaporators and cooling systems ensure the optimal environment, with high humidity and no mixing of odours, so food stays fresher. What this means for you: Separate cooling takes place in the fridge and the freezer through independent evaporators and refrigerants so both are maintained at appropriate temperatures. This also ensures that odours from the freezer do not mix with items in the fresh foods compartment, and both the sections retain optimal humidity.